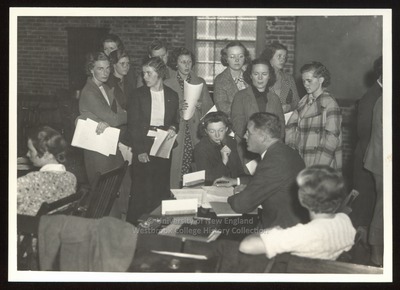 Thirteen Westbrook Junior College students surround the Registrar on registration day in this 1930s black & white photograph. Students stand and sit in the gymnasium as they await their turn to register for courses. Several are holding registration forms and papers. All wear their hair parted on the side with finger or marseille waves. Long woolen coats partially cover their suits or dresses.